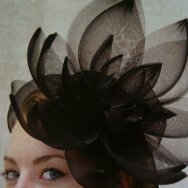 We will be making a water lily style flower using crinoline. Learn how to secure the cut ends of your crin and how to secure your flower to a base. Bring approximately, two metres of fine crinoline in the colours of your choice in each of 2", 4" and 6" widths. All the tools you will need: dolly heads, thread, scissors, sewing machines, blocks, etc. Any of the workshop materials will be available for purchase should you need them. Let us know in advance if possible. A light and airy flower made with crinoline.